Fishing with a hand spear is such an ancient technique that we don’t even know its exact origins. Fishing all started with sharpened sticks, with rock painting evidence that these harpoons were used over 16,000 years ago. Spearfishing is even mentioned in the Bible. American Indians, Amazonian hunters and Australian aboriginals have practiced spearfishing for thousands of years, and still do. Spearfishing in deeper waters became possible when goggles, fins and masks were invented about a century ago. 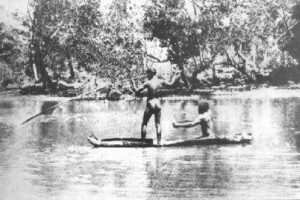 Spearfishing as a modern sport in Australia began in 1917, when Alex Wickham began spearfishing in Sydney Harbour. Nowadays, the hobby -- or profession for some -- has been modernised so much, with gas pneumatic guns, solid shafts and custom-made rubbers, that we almost forget how it was done in the old days. The gear has been reinvented, the equipment streamlined to the max and there is a strong focus on safety. It can't get much easier than we have it now! Can you make your own speargun? But imagine, growing up in a sleepy and poor Italian or Greek fishermen’s community with little else to do than fishing ... Or living on a remote pacific island or on the coast in the Northern Territory or Far North Queensland in Australia and needing to catch a fish for your meal that night... How would you build a speargun? And how would you protect yourself and your catch from sharks and crocodiles? Manufacturing a spear yourself, with a simple pole as a shaft, with a pointy end and a rubber loop made out of any rubber you can get your hands on, shouldn’t take you much more than an hour. As long as you have wood, a knife, some duct tape and a bit of line at your disposal. But this is done with the end product already in mind, knowing how a speargun should work and with a clear picture of a modern gun in your head. Making a speargun from scratch, with only natural materials available, deserves a lot of respect. Tree saplings, sharp stones, and a bit of tough grass was sometimes all they had in the old days. So chapeau to the ancient spearfishermen and thank goodness for modern gear! 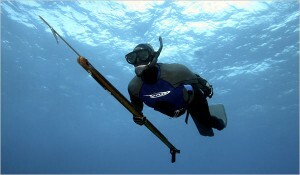 YOUR (HI)STORY Do you, or your parents or grandparents, have any experience with spearfishing the old way? Can you manufacture a gun or do you repair your own gun? How do you do it? Share your story with us below or on our Facebook page!